242 pages | 5 B/W Illus. 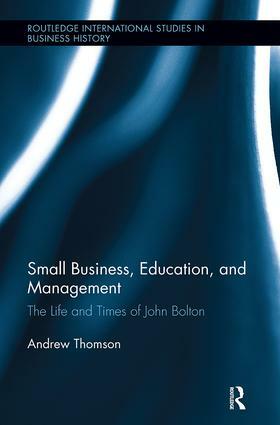 This book examines the life and times of John Bolton, a Cambridge graduate who graduated as a Baker Scholar from Harvard Business School, and returned to Britain to quickly chair Solartron, one of the outstanding of the early British electronics companies in the 1950s. John Bolton also enjoyed a career of public service and private good works. He led the founding of the Foundation for Management Education, which had an extremely influential role in the development of management education in Britain, and chaired the 1968-71 Committee of Inquiry on Small Firms, resulting in what is now generally called the Bolton Report. The Bolton Report became and continues to be the starting point for analysis of the sector at a time when small business is again being seen as a major contributor to the British economy and has revolutionized attitudes and policy towards the small business sector at all levels. Bolton’s career covered a range of different dimensions of mid to late twentieth century industrial and public life in Britain, and the history is as much about these as it is of the man himself. The intention of this book is to illuminate the institutions in which Bolton worked as well as to paint a picture of his own role. Andrew Thomson was Emeritus Professor at The Open University, UK.